There are different types of menu in android like action bar overflow menu, floating action menu, sliding menu, arc menu etc. Arc menu is one of the best ways to display menu in android. There is only one icon/button visible when app is running and other options menu items are only visible when user click on the button like “plus” icon. We can customize it according to our needs; we can add different animation effect, color and so on. Arc menu is also used instead of floating action menu for quick action, but it is arc/rounded shape. In this tutorial, you will learn to implement arc menu in your android application. To implement arc menu with less code and easily, you have to add dependencies in your app build.gradle file. Let’s start by adding compile 'com.sa90.materialarcmenu:library:1.4' dependencies in your app build.gradle file. Build.gradle file will look like below. Here I have added linear layout, text views, material arc menu and floating action buttons to make a complete arc menu inside relative layout. There are four FloatingActionButton inside ArcMenu and their FABs are using design support library so you have to add design support library dependencies in your build.gradle file. If you want to use custom button instead of floating action button you don’t need to add this dependency. I have added only four buttons inside ArcMenu, you can add according your needs. Your all app content goes inside LinearLayout. Following is the complete content of XML layout file. In java activity file, you have to add little bit java code to make arc menu working. Here we control menu items on click event. Java activity file will look like below. 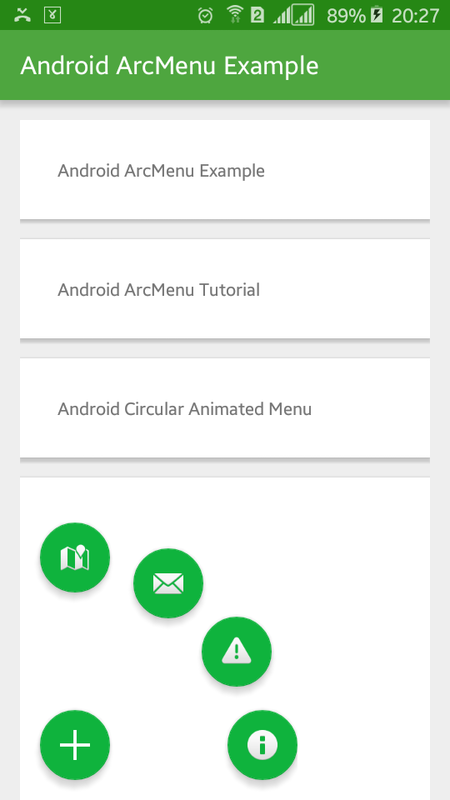 Now, run your Android Arc Menu Tutorial with Example application and click on the plus button, menu items will appear as icon. If you want to change arc menu color, icon etc go to XML layout file and change the color value of app:menu_color and app:backgroundTint and for icon replace icon name of app:menu_scr and android:src.